Baron Pyotr Nikolayevich Wrangel (Russian: Баро́н Пётр Никола́евич Вра́нгель, IPA: [ˈvranɡʲɪlʲ]; German: Freiherr Peter von Wrangel; August 27 [O.S. August 15] 1878 – April 25, 1928) was a Russian officer in the Imperial Russian Army and later commanding general of the anti-Bolshevik White Army in Southern Russia in the later stages of the Russian Civil War. After his side lost the civil war in 1920, he left Russia and became one of the most prominent exiled White émigrés. Wrangel was born in Mukuliai, Kovno Governorate in the Russian Empire (in present-day Zarasai District Municipality, Lithuania). The Wrangel family was of the local Baltic German nobility. Pyotr Nikolayevich Wrangel was only distantly related to the famed Arctic explorer Ferdinand von Wrangel and the Prussian Generalfeldmarschall Friedrich von Wrangel. After graduating from the Rostov Technical High School in 1896 and the Institute of Mining Engineering in St. Petersburg in 1901, Wrangel volunteered for the prestigious Life Guards cavalry and was commissioned a reserve officer in 1902 after graduating from the Nikolaev Cavalry School. He soon resigned his commission, and travelled to Irkutsk, where he was assigned to special missions by the Governor-General. At the start of the Russo-Japanese War, in February 1904, he reenlisted and was assigned to the 2nd Regiment of the Transbaikal Cossack Corps. In December 1904, he was promoted to the rank of lieutenant. After the war ended, in January 1906, he was reassigned to the 55th Finland Dragoon Regiment, which under General A. N. Orlov took part in pacifying rebels in Siberia. In 1907, he returned to the Life Guards Cavalry Regiment. In 1908, he married Olga Mikhaylovna Ivanenko in St. Petersburg, and the marriage produced two sons and two daughters. Wrangel graduated from the Nicholas Imperial General Staff Academy in 1910 and the Cavalry Officers' School in 1911. With the start of World War I, Wrangel was promoted to captain and assigned command of a cavalry squadron. On October 13, 1914, he became one of the first Russian officers to be awarded the Order of St. George (4th degree) in the war, the highest military decoration of the Russian Empire. In December 1914, he was promoted to the rank of colonel. In October 1915, Wrangel was transferred to the Southwestern Front and was appointed commander of the 1st Regiment of the Transbaikal Cossacks. This unit was very active in Galicia against the Austrians, and Wrangel distinguished himself especially during the Brusilov Offensive. He was promoted to the rank of major general in January 1917, and took command of the 2nd Brigade of the Ussuri Cavalry Division, which was merged with other cavalry units to become the Consolidated Cavalry Corps in July of the same year. He was further decorated with the George Cross (4th degree) for his defense of the Zbruch River in the summer of 1917. Following the end of Russia's participation in the war, Wrangel resigned his commission and went to live at his dacha at Yalta in the Crimea. Arrested by the Bolsheviks at the end of 1917, he was released and escaped to Kiev, where he joined Pavlo Skoropadskyi's Ukrainian State. However, it was soon apparent to him that the new government existed only through the waning support of Germany, and in August 1918, he joined the anti-Bolshevik Volunteer Army based at Yekaterinodar, where he was given command of the 1st Cavalry Division and the rank of major general in the White movement. After the Second Kuban Campaign in late 1918, he was promoted to lieutenant general, and his Division was raised to that of a corps. As an aggressive commander, he won a number of victories in the north Caucasus. From January 1919, his military force was renamed the Caucasus Volunteer Army. 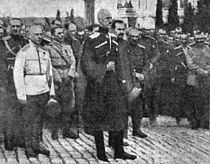 Wrangel soon clashed politically with Armed Forces of South Russia leader Anton Denikin, who demanded a quick march on Moscow. 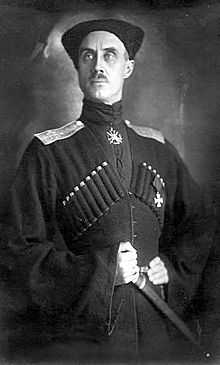 Wrangel insisted instead that his forces should take Tsaritsyn first, to join up with the army of Admiral Aleksandr Kolchak, which his troops accomplished on June 30, 1919 after three previous attempts by Pyotr Krasnov had failed in 1918. Wrangel gained a reputation as a skilled and just administrator, who, in contrast to some other White Army generals, did not tolerate lawlessness or looting by his troops. However, after he was unable to join forces with Admiral Kolchak and at the insistence of Denikin, he led his forces north towards Moscow on a failed attempt by the Whites to take the capital in Autumn 1919. Continuing disagreement with Denikin led to his removal from command, and Wrangel departed for exile to Constantinople on February 8, 1920. 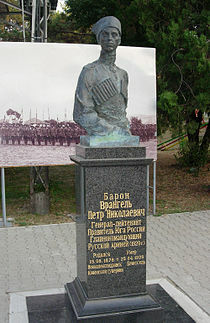 Yet Denikin was forced to resign on March 20, 1920, and a military committee led by General Abram Dragomirov in Sevastopol asked that Wrangel return as Commander-in-Chief of the White forces in Crimea. He assumed the post on April 4, 1920 at the head of the Russian Army, and put forth a coalition government which attempted to institute sweeping reforms (including land reforms). He also recognized and established relations with the new (and short lived) anti-Bolshevik independent republics of Ukraine and Georgia, among others. However, by this stage in the Russian Civil War, such measures were too late, and the White movement was rapidly losing support both domestically and overseas. Wrangel is immortalized by the nickname of "Black Baron" in the marching song The Red Army is the Strongest composed as a rallying call for a final effort on the part of the Bolsheviks to end the war; the song became immensely popular in the early Soviet Union during the 1920s. At a prayer vigil upon accepting command. After defeats in which he lost half his standing army, and facing defeat in Northern Tavria and the Crimea, Wrangel organized a mass evacuation on the shores of the Black Sea. Wrangel gave every officer, soldier, and civilian the choice to evacuate and go with him into the unknown, or remain in Russia and face the wrath of the Red Army. Wrangel evacuated the White forces from the Crimea in 1920 in remnants of the Russian Imperial Navy that became known as Wrangel's fleet. The last military and civilian personnel left Russia with Wrangel on board the General Kornilov on November 14, 1920. Initially, Wrangel lived on his yacht Lucullus at Constantinople, which was rammed and sunk by the Italian steamer Adria, which had sailed from Soviet-held Batum. Wrangel, who was on shore at the time, escaped with his life in what was widely regarded as an assassination attempt. In 1922, he moved to the Kingdom of Serbs, Croats and Slovenes as the head of all Russian refugees, and arguably became the most prominent of all exiled White emigres. 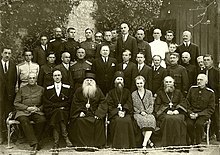 In 1924, in the Serbian town of Sremski Karlovci he established the Russian All-Military Union, an ostensibly non-military organization designed to embrace all Russian military émigrés the world over with a view to preserving a Russian military organisation for the eventuality of having to fight Bolshevism again. In September 1927, Wrangel and his family settled in Brussels, Belgium, where he worked as a mining engineer. Wrangel's memoirs were published in the magazine White Cause (Белое дело) in Berlin in 1928. Wrangel died suddenly on April 25, 1928, and Wrangel's family believed that he had been poisoned by his butler's brother, who lived in the Wrangel household in Brussels briefly and was allegedly a Soviet agent. Pyotr Wrangel's burial took place in Brussels; however, more than a year later, on October 6, 1929, his body was brought to Belgrade, where in a solemn public ceremony it was re-interred in the Russian church in Belgrade, in accordance with his wishes. The town of Sremski Karlovci, which served as his headquarters and was at the time of his death the location of the Holy Synod of the Russian Orthodox Church Outside of Russia and the Russian Ministry of Culture, erected a monument in his honour. For many of the Russian officers, Wrangel's figure remained highly influential and had almost a semisacred status. After Hitler's invasion of the USSR in June 1941, some prominent military émigrés referred to his position that he, in their understanding, would have taken. For example, Major-General Mikhail Mikhailovich Zinkevich assumed in mid-August 1941: 'If General Wrangel were alive today, he would go unhesitatingly with the Germans'. Order of St. Stanislaus 3rd class, with swords and bow, 6 January 1906. ^ ″Главни војни циљ барона Врангела″. // Politika, 7 December 2017, p. 21. ^ Volodarsky, Boris. "The KGB's Poison Factory, from Lenin to Litvinenko". Frontline Books: 2009, p. 58. ^ ″Смрт и сахрана генерала Врангела у Београду: Чувени бели генерал је, по сопственој жељи, сахрањен у руској Цркви Свете Тројице на Ташмајдану.″ // Politika, 18 January 2018, p. 20. ^ Споменик белом барону Politika, 13 September 2007. ^ O. Beyda, ‘“Re-Fighting the Civil War”: Second Lieutenant Mikhail Aleksandrovich Gubanov’. Jahrbücher für Geschichte Osteuropas, Vol. 66, No. 2, 2018, p. 253. Always With Honour. By General Baron Peter N Wrangel. Robert Speller & sons. New York. 1957. Vinogradoff, Paul (1922). "Wrangel, Peter Nicholaievich, Baron" . Encyclopædia Britannica (12th ed. ).